African states monitoring Zimbabwe's election campaign have added their voice to growing international pressure over the presidential run-off vote. The head of a troika of observer states told the BBC violence could make a free vote impossible but his concerns were dismissed by the ruling Zanu-PF party. The opposition has suffered five violent deaths in recent days, among them the wife of Harare's mayor-elect. One of its top leaders has also been charged with treason and subversion. Tendai Biti, who as secretary general of the Movement for Democratic Change (MDC) has often deputised for presidential candidate Morgan Tsvangirai, was arrested last week after returning from South Africa. 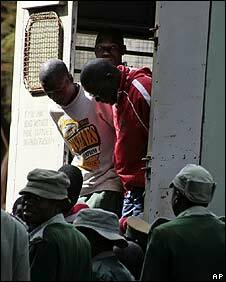 If convicted, Mr Biti could face the death penalty. The MDC will see his trial as a further move by the state to destroy its election campaign, the BBC's Peter Biles reports. Mr Tsvangirai, who attended Thursday's court hearing, described the charges against Mr Biti as "frivolous". US Secretary of State Condoleezza Rice has told an informal meeting of the UN Security Council that the actions of Zimbabwe's government have ensured the vote will be neither free nor fair. "By its actions, the Mugabe regime has given up any pretence that the 27 June elections will be allowed to proceed in a free and fair manner," she said. Tanzanian Foreign Minister Bernard Membe addressed a news conference on behalf of the three nations - Tanzania, Angola and Swaziland - from the Southern African Development Community (SADC) monitoring the polls. "The first impression we have is that if the elections were to take place today, these elections would never be free and fair... because... the report we received still indicates that violence is escalating throughout Zimbabwe," he told the BBC. "We have received a report that says on the 16th of June this year, as the observers were being deployed to those various stations, two people were shot dead. "Of course, it scared most of these observers to the extent that they had to pose the question of why are we here then, and what are we doing?" "There is a derailment of Mr Tsvangirai wherever he wants to go to campaign, he's detained at police stations," Mr Membe added. Speaking for the Zimbabwean ruling party, Jerome Macdonald Gumbo accused the Tanzanian foreign minister of bias. "Skirmishes between the MDC and Zanu-PF are normal but not to the extent that the elections cannot be free and fair," he told the BBC's Focus on Africa programme. "He [Mr Membe] is biased." Such severe criticism of President Mugabe by a senior African politician could mark a significant shift in opinion on the continent, BBC world affairs correspondent Mark Doyle reports. Mr Membe's comments are significant because for many years President Mugabe has sought to deflect criticism of his policies by saying attacks on him are masterminded by the West. But the impact of Mr Membe's intervention is not yet clear, our correspondent adds: it may infuriate Mr Mugabe or it may be calculated to encourage him to compromise. Zimbabwe's own independent electoral watchdog, the election support network, says it has at last been formally invited to monitor the poll but only with 500 observers. That is a tiny fraction of the 12,000 the network had hoped to deploy to keep track of the 9,000 polling stations that will be opened on election day. The MDC says at least 70 of its supporters have now been killed and 25,000 forced from their homes in a state-sponsored campaign of violence. 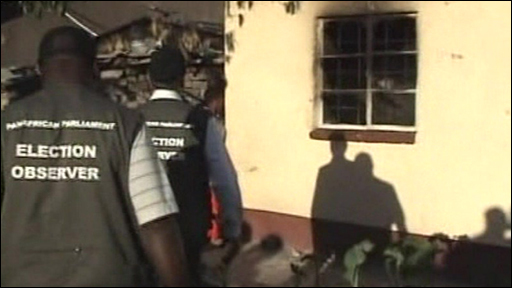 The bodies of four party members were found near the capital Harare on Thursday. They had been abducted and tortured to death, the party said. Amnesty International said on Thursday that 12 bodies of people "tortured to death by their abductors" had recently been found in various parts of Zimbabwe. Emmanuel Chiroto, recently elected mayor of Harare for the MDC, has been giving details of the death of his wife Abigail. She is believed to have been abducted on Monday along with her son, 4, while her husband was away. Her son Ashley was left alive at a police station. Speaking to BBC Radio Four, Emmanuel Chiroto said his wife's body had been hard to identify. "She was badly swollen, it was like they used a club or some blunt object to smash her head and blood had been coming out of her mouth, nostrils and ears," the mayor-elect of Harare said. "We thought it was going to be an election not war," he added. "If it was war we'd not have participated." Mr Chiroto held the Zanu-PF party responsible for his wife's death.